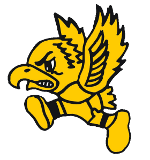 Renee Selle and Emily Cook won singles matches for the varsity, while Julie and Tara Genzink took the only doubles flight for the Hawkeyes. A group of students, teachers and parents met separately with the three final candidates for the job of Hamilton High School principal. STREAM school is a new program in the middle school that students, teachers, and parents are loving. Disney’s Tarzan made its appearance at Hamilton High School Dec. 4-6 in many different ways. Standards Based Grading has made an appearance in some classes at Hamilton High School this 2014-15 school year. The 2014-15 school year saw the 5th graders move from the elementary schools to Hamilton Middle School. With a strong finish, the varsity golf girls had a great year. For most of the JV golfers, they enjoyed their first year of golf while learning the sport.